Epicurean Style is a vintage-inspired apron company that proves beauty, style and practicality can all be one. Styles are influenced by romantic visions of the past and are designed in vibrant colors, delightful patterns, and figure flattering shapes. These fine quality, retro-chic aprons make the perfect fashion accessory in or out of the kitchen. Oh boy am I excited about today's giveaway. I have waited and waited for this day.. I found these aprons long before the launch of the website on a photographer's blog. It was love at first site. I knew I had to have one of these beautiful aprons. They inspired me, spoke to me and reminded me that..
there is so much more to wearing an apron than just in the kitchen. Bathtime, Feeding the little ones, gardening or cleaning. It can be the perfect accessory to any daunting task and wearing one might actually make those tasks slightly less daunting, making you feel a bit more feminine which is always a good thing. My favorite apron is the Penelope. I find it to be perfectly lovely. And when one side gets dirty, or your looking for a change, just flip the apron around for a whole new look. There are multiple styles to choose from, some come in kits for you to make your own, and others come fully made. Which apron is calling your name? Does random picker ever pick #1??!! I guess we will find out... I love the Penelope apron. THanks for the giveaway, Happy Mother's Day! ooh my favourite is elsie - i can hear it calling my name from so far away! I LOVE these aprons! I'd have to say Molly is my favorite. I love the paisley but penelope is a close second. what a lovely site. i think i like the madison the best - i always feel like half aprons don't protect me where i want the protection - my torso. I like the Lola and the Susie. Penelope looks like my favorite right now. They are all so cute! Wow! So many of the aprons were already sold out and I can see why. Love the Lola! all the aprons are beautiful! penelope! so so adorable!I also like the Emily a lot. I love the Emily, but the fringe on the Penelope almost makes me love it more! I like Paisley. I also really liked the one from the last photo on the post, but didn't see it on the website. I just love the penelope! It's my fave! The are all so cute! i love the susie and the penelope. i have been looking for a great full apron. please pick me!! i agree. the penelope is quite lovely. thank you! The Penelope stole my heart, what gorgeous aprons! love love these aprons!! penelope is my fav! what a perfect gift! I am with you, Penelope all the way!! I love, love, love it!! Oh the penelope apron is calling my name! It's so adorable! Oh, I hope I win! I love the Penelope as well! Gorgeous. I love the Elsie apron! I agree - the Penelope is lovely. All these aprons are so cute, and I know I'd feel so cute in one! I want to "Meet Susie!" love these aprons! it is hard to choose between claire and penelope but I think penelope has the edge! The Madison... by the way, thank you for these wonderful Mother's Day giveaways! Elsie and Emily are both awesome! very cute. i like the penelope. I love the Lola and the Paisley! They are so wonderful! Penelope! It is calling me! The Lola apron is perfection... but they are out of stock! What will I do without one? I've been lusting after the penelope apron for weeks! My favorite one is the Elsie! I'm with you ... the Penelope is my fave! I hear the lolo to infinity! Oh oh oh, Penelope please! I've always wanted a cute apron! What a perfect Mother's Day giveaway. I love the Lola and the Penelope designs. I love the Susie! How cute are these! They are all adorable, but I really love the Penelope! I dig both the molly and the penelope. So cute! They are all so lovely and I love that they are reversable. I think the penelope is so cute! Well of course the one I love is out of stock...the Lola! But I think the paisley is fantastic also! I do so love aprons! I have to say the Penelope, with its great trims, is my favorite! The Penelope is not only calling my name...it is yelling my name at the top of its beautiful lungs. What a great idea! I love that they flip and must have one. Paisley and penelope are cute! I want the susie!! I think I may have to order one if I dont win! I am hearing Penelope calling my name! They are all beautiful though. This is perfect for cooking ( ahhhh, I am not much of a cook), or crafting ( we are getting warmer), and of course bathtime with my little one who loves to splash ( who can blame her- it is fun to splash)! This would also be a great Mother's Day gift, and what do you know, it is MY first Mother's Day. Yay! I love these! I think the penelope is so adorable! i LOVE the penelope apron...such a great mix of colors and a fabulous name! I'm with you, the Penelope is So cute! Of course I would take the Lola, too! i love how you can flip it! i really like the suzie..but also love the litttle dangles on the penelope. tough choice between the 2.
i actually love the lola!!!! penelope & lola. i bet these would motivate me to actually get into the kitchen to cook! Penelope is my favorite!!! They are all amazing! I love the paisley design. So darling! The Susie is the one I'm coventing. I would love the pattern to that one to actually make it! The penelope is adorable! I love these aprons. So glad to know about this site! They are all so great! I think the Penelope is my favorite! Beautiful! I especially love the Penelope. omigoodness...lovely aprons! penelope is my fave! lola is cute too, with all those ruffles. I love all of them, but the suzie is screaming my name. My fave is the Penelope... too cute. I love it!! Penelope is beautiful! What fun to bake something while wearing this. Oh, most certainly Susie. Quite appropriate as my mom's name is Susan and Dad calls her...."Susie!" across the room, house, yard. i am loving the elsie or paisley. both so cute! 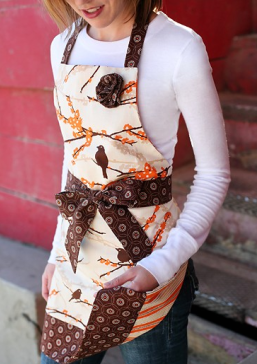 Oh,I fell in love with these aprons too when I first saw them on Design Mom. I like the susie and the molly. How great! I love the susie and paisley! so cute! I adore the Penelope too! The Paisley is my favorite. So darling! I love wearing aprons and these are adorable! My favorite(s) are the penelope or lola, which unfortunately is out of stock. So cute! I just posted about these this past monday. I want the PENELOPE soooo bad!! Seriously I think about it all the time during the day...I'm weird I know...but I love it that much! i love the susie. ! thanks for the giveaway! OOOOOOOOOH, I love these aprons! I've seen them before and didn't know where to find them! Thank you for the link...and the giveaway! Penelope is by far calling to me, with Zowie filling in some harmony! Oooh I love the Lola and Paisley! Penelope!! I love the little danglies at the bottom! So cute! I have to go with Penelope! Love it. Penolope, get on my body!!! I love the Zowie...! So cute! Penelope and Lola are both calling my name! I love aprons! And I do so love the Penelope, pick me! And I love anything paisley... too fun! I think that the one I like is called Meet Susie. Love the brown and the birds. 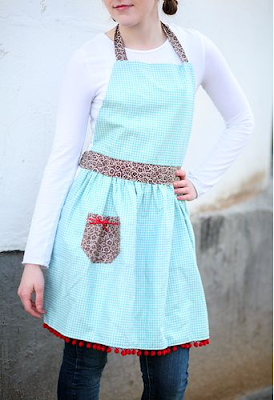 I love those aprons - my favorite is the patchwork one with pom poms...too cute! I love to zowie (too bad it's out of stock or i probably would have purchased it immediately!) 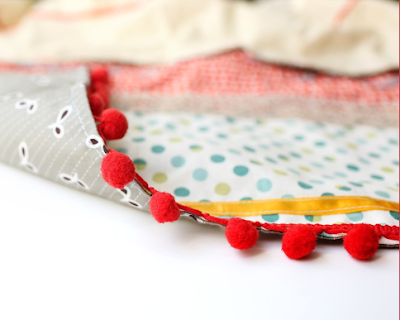 I'd also have to say the little red balls sold me on the Penelope apron. I LOVE the chocolate brown and orange one. I LOVE the Penelope and the Molly. My favorite is also the penelope, so cute! SO cute and feminine. It would definitely make it seem more fun to do chores around the house if you were wearing one of these! My favorite it the Penelope! I love the penelope the best. Whitney Miller: I love the Susie and Penelope! I'm lovin' the penelope also. These aprons have got it going on! I like the 'molly'. Swoon! These aprons are to die for. They are too pretty to get soiled! i love the penelope or lola. so so fabulous! i might just have to cook a little more! I hope to win! I love love love the apron! I love all of them but I think I'd choose the Paizley. I love the Zowie...the ruffles are adorable! Love, love, LOVE the Susie! Susie or Penelope! Love these! this one's easy....the penelope is my fav! I love these aprons! The penelope is my absolute favorite!!! "This is Penelope calling Angi Wood...come in Angi Wood!" oh, that penelope is too adorable! even the name, the pom pom trim, i'm in love! i would love any and all of them. Definitely the Penelope apron! It looks like it could help make cleaning fun too! I'm in love with the Penelope as well. It even matches my kitchen. Too cute!! I love the susie birds!!! The picture of the mom with the apron on while giving a bath is awesome. These aprons make you look cute while doing everyday things. The susie is so cute. For me it is tie between Lola and Paisley, both very cute! Thanks! I love paisley. I wear an apron daily and I love them! I would have to say that I love the Suzie apron the best. It was a hard decision I'm not gonna lie. Well I just LOVE the Susie, but I could be happy with the Zowie too! i'm hoping today is my lucky day..
because the penelope apron is calling my name! The Molly apron (even though it seems to be out of stock)! I like Penelope and the Susie. hmmm... Paisley or Penelope...that's a tough call. I think it's the Penelope! I love the first one :) Its lovely. The Penelope? giving AWAY most of our things as we prep to leave but an apron is a MUST pack for the trip. My fave/ The penelope - runner up - Lola. just lovely! I love the Penelope the best!!! I love the paisley, although they're all great! i'm with you - i love the penelope! although they're all darling! I think right now my favorite is Susie, with Penelope a close second. I also think I could change my mind every 5 minutes because they're all so cute! SO Cute!! I love the Susie...Thanks for the chance to win it! I love the Emily apron! I love, love, love the Paisley apron!! I love them all! But the penelope is the one for me! Elsie is calling my name. Please pick me, I will wear that apron while I blog, design and craft. I might allow it in the kitchen, and I might even wear it out in public. It's that cool. Thanks for the fun giveaway! The penelope apron is so dang cute!! I love the "Susie" apron! My favriote is Lola! It is calling my name loud and clear. "penelope" is calling my name! Ohhh I need one of these aprons!! I like the Elsie. I have been stalking the Penelope ever since I first saw it. Pick ME! I also love the Lola... so feminine! I can't decide between the Elise or Susie. The Susie is calling my name. The orange and brown and birds together are AMAZING!!! Hi, I like the penelope, also the molly because my little sis has the same name, which I love her and her name. My name is Amy and I really want to win, cuz I never win anything. Thanks for the give away. Penelope is calling my name! So cute. I love the Susie! Very cute! Love the Susie. Need the Susie! Please! The Penelope is to die for! I just checked out the site and found out the talent behind Epicurean is my friend & neighbor. WHAT? She's brilliant. I heart the Penelope apron!!!! What a fun fun fun giveaway!!!! I hope I win!!! I love wearing aprons & the Zowie is my favorite! But all are so great! Penelope, Paisley, don't forget Molly, all of them, you can't go wrong. how fun . . . i came across these adorable aprons the other day!! i absolutely fell in love with the penelope!!! i hope it's my lucky day!!! 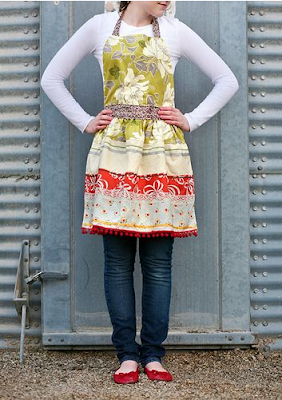 I just blogged about these awesome aprons too! I love the Lola apron! I love them all!! If I had to choose just one it would be the Penelope. I love the meet susie. The bird fabric is so cute! I love the Penelope and Paisley! They are all calling my name! Are you serious?! adorable! So many lovely aprons. I would love to win one. So hard to pick one....I loved the Elsie, Susie, and Molly. Darling!!! Penelope-I love the ball fringe. Delisious!